Luke and Rylee had a GREAT birthday (or should I say birthdays). They celebrated together with a swimming party at Pa’s house with lots of their friends and family. The kids all loved the pool and the big water slide. Afterwards, they both said they had a wonderful time and so much fun. They never did quite get the “blowing the candles out” thing figured out since they were sharing a cake and had to blow at the same time. Their blue underwater cake was made by none other than their beautiful Mom, Ashley. 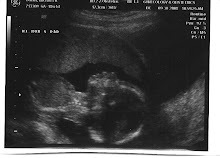 Speaking of Ashley, she went for her 2nd ultrasound this past Friday. The ultrasound tech told them the baby was showing out by waving, and putting it’s foot in it’s mouth. Everything looked good and she and Pete didn’t get weak about their decision to not find out whether it is a girl or a boy. We will all have a big surprise this December and can’t wait! Luke got to see the ultrasound and was really impressed. He asked lots of questions and was excited to be involved. He wants to be in the room when the baby is born. We’ll see how that goes. Rylee won’t even talk about a new baby in the house. Russ started his job at the prison on July 23 and was glad to finally get started. He will be going to Georgia sometime soon for three weeks of training. Everything has fallen into place for him since he came back from Iraq in April and then home for good in May. We are so happy to have him home!!!!!!!!!!!!!! Erin will start her last year of nursing school next month – YEA!!! As for me, I have been in New Orleans for 11 months now and plan on being home no later than the end of October. This has been a long hard year for me and I will be so glad to get home to my family. It has never gotten any easier to be away from home……..